Product | TrunkbusterTM,world's most efficient Oil Palm Trunk Pulverizer. 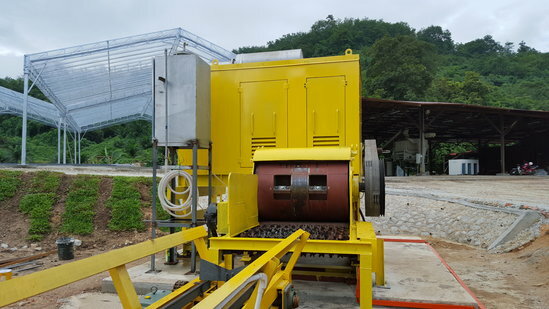 The Trunkbuster machine is designed to efficiently pulverize Oil Palm Trunks (OPT) of any length in a single pass. Trunks must be free of petioles and dirt as these will cause blades to blunt prematurely. Typically trunks achieve heights in excess of 10m when they are felled during replanting program. In order to ensure sustainability of nutrient return to the soil, only 28 feet or about 8.5 meters per tree is removed from the field. We call this Twenty eight Foot Length of trunk as one TFL. The diameter of trunk varies widely between 450 to 650 mm. Our machine pulverizes one TFL of trunk within 2 - 4 minutes, while consuming less than 2 litres of fuel. The set of ten blades normally processes about 250 TFL's of trunk before blades need to be changed. ​Note: all images are for illustration purposes only.